I see the leaves in a second turning right now. The poplars and oaks have joined the maples in their color display. Instead of striking pops of color amongst green, our woods are turning towards a more homogenous blend of yellowish tan. And there is definitely still outrageous color hidden in some of those leaves. Believe me when I say I'm enjoying every last bit of it. The leaves seem to provide their own light on my evening walks on our trail. Soft crunching leaves beneath my feet, fingers and nose nipped with cold. I love these days, fleeting though they may be. I hope you're enjoying whatever the season is offering you right now. Happy news for me on a Monday, my leaf project from a few autumns ago has been featured in Family Fun magazine. The new October issue has just hit stands and there is my little rainbow of leaves on page 18. It's a really cute little magazine. In thumbing through the pages looking for my contribution I've already spotted 3 different things I want to do with the kids and I haven't even looked through the whole thing yet. Thanks Family Fun, for having me! And happy Monday to you all. A few weeks ago I spent some time dyeing wool in my fire pit. 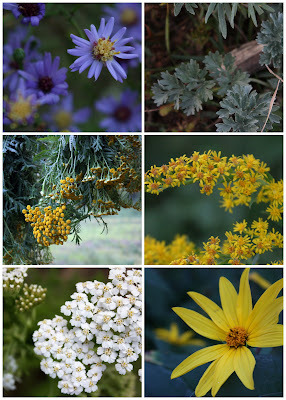 Purple asters, yarrow, artemisa...they all gave yellows in varying shades. Spending time by the fire with the sound of dabbling ducks in the background makes me happy to my core. Though the foliage has changed color by now, the ducks are still out there dabbling and it makes me want to stoke the fire up all over again. The colors I achieved here were from (top right, moving clockwise) goldenrod, purple asters, that yellow daisy-like flower I still haven't identified, dried tansy stems, artemisia (absinthe), and yarrow. I used alum as a mordant. I could hold these colors up to the sky right now and find perfect matches in the changing leaves. Mother Nature knows her colors. I'm none too eager for her to show me white, but I'll take these yellows any day. A friend of mine, who works with paper, recently mentioned that Modge-Podge "highs" were what she considered to be an occupational hazard. I joke about my own. When teaching a needle-felting class I make the same lame joke about it being akin to "at-home phlebotomy", given the number of times the needle draws blood. There are the finger nips from the band saw to deal with too, but you know which one really makes me squirm? Acorns play host to grubs and come fall when I'm working with acorns, I'm working with grubs too. Now, Green Deane says they're edible, a little chewy like fat when raw, and buttery once cooked (don't cook them too hot, they'll explode o_O )but I'm just going to take his word for it. My chickens, on the other hand, LOVE them and that works just fine for me. Have a good Monday all. I hope the rest of your week is less weird than this post. This past week has been a little different than I anticipated when I said I'd be taking some time to enjoy the transition from summer to autumn. Everything is mostly fine now but we had a health scare for one of my family members that has me thinking about my perspective on a lot of things. The reality of an ambulance ride and ER visit, and a week of adjustment to medications has taken up a huge amount of my time and focus. Things are smoother now, I feel more calm. I picked up my camera this morning for the first time in almost two weeks, ready to see things again. I finished packing up acorn orders that were supposed to go out on Monday, (I'm so sorry, everyone, for the delay), I'm getting to those tomatoes I wanted to can, and feeling the urge to work on new projects, but also feeling a new sense of responsibility. Changes are on the horizon and I'm going to make the best of them. But enough of that for now. Did you recognize that the first photo up there was an acorn that had been cut open? It looks like a flower to me. I'm sure there's a metaphor there about pretty flowers inside of every nut, but I haven't had enough coffee yet to figure it out. Happy Wednesday everyone, and happy healthy thoughts to you. The leaves are turning, the crops are ripening, and summer vacation is coming to an end. We're spending a little time enjoying the transition.